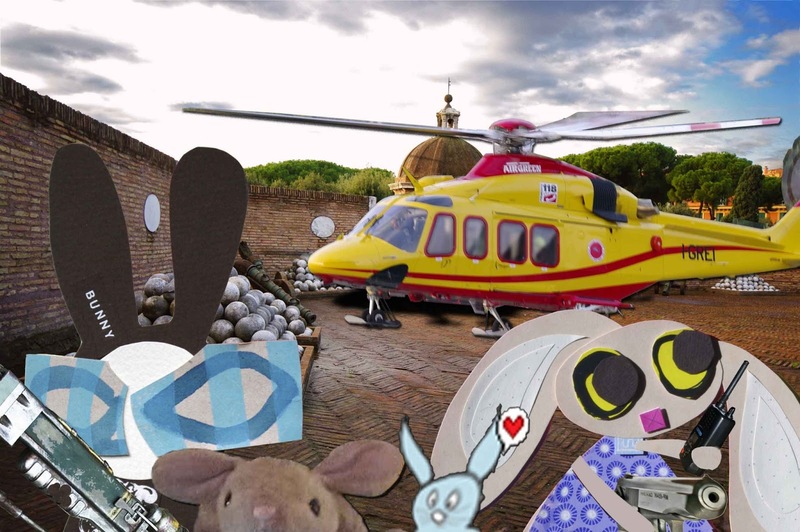 Lapinette and the Wabbit hopped quickly from the helichopper keeping their diplomats under close protection. Lapinette's radio suddenly burst into life. "Hello Trixie, the wranglers report that things are busy, have my nieces arrived?" "Hello Mother," said Lapinette, "yes, our guests are here for dinner and they came a long way." "Take their hats and come on in," said the radio, "the aperitivi are on the table." "What's that about your mother's aperitivo?" said the Wabbit. "It's code, Wabbit" said Lapinette. The Wabbit heard the slide on her automatic and he tightened his grip on the laser gun that he and Snail had made in a shed. "There are uninvited guests," whispered Lapinette. "Be on your guard!" Looking hastily from side to side Lapinette and the Wabbit hurried Pink Bunny and Rettet Kaninchen across the courtyard. "What's that?" asked Pink Bunny pointing at the Wabbit's strange looking weapon. "Oh," said the Wabbit, "just something Snail and I invented." "Wer ist die Schnecke?" said Rettet Kaninchen? "Snail's a good friend," said the Wabbit. "Everything's ready for your top-level discussions." said Lapinette to the diplomats. "What's our accommodation like?" asked Pink Bunny. "Basic, I'm afraid," said Lapinette. "But if you need anything, just ask the Wabbit." The diplomats turned to the Wabbit. "Anything I can get you?" he smiled. "Carrot aperitivi," they chorused.